When Larry Jerome invites you to take a tour of the bloodstock at Jerland Farms, pack a lunch and just say “yes.” Don’t misunderstand. The trip up to Jerland Farms in Barron, Wisc., is worth every minute and every mile. After spending his entire life breeding world-class bloodstock with numerous species, Larry Jerome has evolved into a true breeder’s breeder and what he has to share with you about Arabian horses, Holstein cattle and German Shepherd dogs is a college education tucked into a few precious hours or a day. Do others share this opinion? The shelf area in his dining room is lined with a hundred ceramic plates from all over the globe, thanking him for his programs, his bloodstock and his graciously shared wisdom. Larry’s motto for his Holsteins is “To Make the Best Better.” For the German Shepherds it’s “Breeding the Total Dog,” and for the Arabian horse, it could simply encompass both concepts. His 150 Arabian horses are a dynamic mix of halter and performance bloodlines and his current goal is to breed beautiful Arabian horses suitable for many tasks. He has produced national winning horses in several divisions already, though his increasing use of National Champion *Khadraj+++/ NA is rapidly evolving into serious international strength in the halter, western pleasure and soon, even the working western divisions. Jerland Farms’ broodmare band was created with a strong foundation in the best, classic Arabian tradition, utilizing broodmares descended from Gazon, Gamaar, Bey Shah+, *Padron and Fame VF+. Larry then added the Da Vinci FM son, MPA Giovanni (x Glitzy, by FS Ritz), a charismatic halter horse who went from a U.S. National top ten in the 2003 Sweepstakes Yearling Colt class to a 2005 U.S. National Championship in Futurity Colts. MPA Giovanni’s success as a sire of beautiful, winning halter horses is a matter of record and his youngsters have won national honors domestically and globally. But Larry was still shopping, and in Scottsdale of 2011 he bought a *Khadraj NA filly from Petroglyph Arabians and told them, “… if you ever consider selling *Khadraj NA, call me.” The call came and *Khadraj NA joined the breeding program at Jerland Farm. Even Larry could not have guessed at the time what measure of notoriety, breeding success and that rare element … greatness, *Khadraj NA would bring to the Jerland Arabian herd. There are a great many reasons to admire *Khadraj NA+++/ as an Arabian horse and as a breeding sire. To begin, his life story reads like a tale from the Arabian Nights. Foaled in 1991 at Nagib Audi’s Fazenda Santa Gertrudas in Sao Paolo, Brazil, a breeding program that approaches the mythical in its character and the legend it fostered, he was named almost immediately following his birth because Adelia Audi said that, “He simply looked like ‘Khadraj’ to me.” He became the youngest national champion in Brazilian history after being named Brazilian National Champion Foal At Side before he was weaned. When the Audi herd was liquidated, the colt caught the eye of Afonso and Carlos Bortolotto. They were completely smitten with the youngster, but did not have the money to buy the colt and somehow convinced the Audis to take precious stones in exchange for the horse. Thus, like a true, young Prince of the Desert, *Khadraj NA was purchased for a bag of raw, uncut emeralds. The sire of *Khadraj NA+++/ was the Brazilian-bred stallion *Ponomarev, a son of *Salon out of a *Salon daughter, the only mating of its kind in the world. *Khadraj NA’s dam was the stunningly beautiful *Padron daughter, Khatreena NA, and her dam *Kateesia was a daughter of National Champion Kaborr+++. In 1995 *Khadraj NA+++/ arrived in America, imported there by Rose Taylor. He had been obtained from the Bortolottos to breed to the R-A Aloha daughters of Fame VF+. He wasted no time becoming a multiple national top ten halter stallion in the U.S. and Canada. *Khadraj NA didn’t actually appear in a show ring under saddle until he was 10 and then, hit his stride as a western pleasure horse two show seasons later, when he was 12. In July of that exciting summer, at Region 5, he won the open western pleasure with his trainer, Greg Harris, and the AAOTR 18-39 with Devon Benbrook up. At the Canadian Nationals in August, he took the ring by storm, winning national championships in those same classes with Greg and Devon at the reins. The Canadian Nationals was particularly gratifying that year as his daughter, NNL Emerald Bey, was top ten in the open western pleasure, as was RA Monaco+//. In fact, as though to support their illustrious sire in his Canadian Nationals bid, no fewer than eight *Khadraj NA offspring won top ten awards at the 2003 Canadian National show, six in performance and two in halter. And most delightful of all, his son Kharaktor++/ was 2003 Canadian National Champion Western Pleasure Junior Horse. Though specifically brought to America to cross with Fame VF+, *Khadraj NA+++/ also crossed well with daughters of Fame VF+’s sire, Bey Shah+. *Khadraj NA’s top purebred performance offspring list would have to include multi-national champion Kharismatic PGA+//, (x Aphrodite FA, by Fame VF+), multi-national champion Khontroversy PGA+// (x Enfenee, by Barzik++), national and reserve national champion, RA Monaco+// (x Roze of Shah, by Bey Shah+), 5-time national and reserve national champion, Garth MH+// (x Dancing Gdynia, by TF Break Gdansk), and 8-time national and reserve national champion, RA Lanai (x Sablefire, by Fire On Ice). Though he has sired comparatively few Half-Arabian offspring, he has 17 Half-Arabian national winners, 12 in performance, three in halter and two in both. In truth, one of Khadraj NA’s best show horse offspring is the Half-Arabian, Khardinal Sin+// (x Sumis Violet, by My America), 7-time national champion and reserve in hunter pleasure divisions, open and amateur, and 16-time top ten! Larry Jerome could be called part of an endangered species. At this point, real Arabian horse breeders are few and far between. Yes, we have people who breed a few horses, and numerous trainers who readily promote the stallions they are standing. But the really dedicated, lifelong horse breeders … there’s just a few. The Sheila Varians and Bazy Tankersleys are leaving us, one by one. Great breeding technique takes the wisdom of an entire lifetime, sometimes two or three generations. If your desire is to be a great breeder, or even just to be a reasonably good one, take the time and learn from the few we have. They, and their advice, are priceless, just like the great Arabian horses they breed. Here’s a thought … why not start by going up to visit the Jerome family and national champion *Khadraj NA+++/ at the legendary sire’s birthday party celebration on August 27th-28th, at Jerland Farms in Barron, Wisc. There’s a whole lot of fun planned for the two days, starting with *Khadraj NA’s+++/ 25th party with all of the trimmings, including a presentation of over 30 sale and breeding horses, and a tribute with stories and testimonials by the people who know *Khadraj the best, Luciano Cury, Rodolfo Guzzo, Greg Harris and David Boggs. There’s also a series of clinics with noteworthy Arabian horsemen: JT Keller, Gordon Potts and Liz Bentley, ably assisted by Stanley White III, Sarah Paripovich, Pam Rose, Abe Cotton, Elizabeth Steward and Zac Powell. There will be lunch and dinner on Saturday, where Larry’s daughter’s band, Well Known Strangers, are providing the music. Sunday brunch will be followed by a presentation of *Khadraj NA foals. Carol Nierenberg will unveil her new bronze of *Khadraj NA+++/ and artist/designer, Lee Marquardt, from New Prague, Minn., will provide some special surprises of his own. RSVP’s are required. Contact Larry Jerome at (715) 205-0357 or Indira Van Handel at (715) 205-1345. E-mail: larry.jerome@jerland.com. *Khadraj NA+++/was bred by Nagib Audi at Fazenda Santa Gertrudas in Sao Paulo, Brazil. 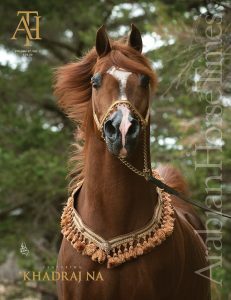 Imported into the United States by Rose Taylor, R-A Aloha Arabians, and owned since 2007 by Larry Jerome of Jerland Farms, Barron, Wisconsin, *Khadraj NA+++/ is now the Leading Living Sire of National Winning Arabian Western Pleasure Division horses in North America. In 2015, twenty-two *Khadraj NA+++/ get won national show honors. These winners included national and reserve national champions: RA Lanai, 2015 Youth National Champion Reining Seat Equitation JTR 14-18; Khontroversy PGA+//, 2015 Youth National Champion Western Pleasure JTR 14-18; Possesion PGA+, 2015 Canadian National Reserve Champion AAOTR 40 & Over and U.S. National Reserve Champion Western Pleasure AAOTR 36-54; Gaibrialla, 2015 U.S. National Champion Western Pleasure AAOTR 55 & Over; Bellini, 2015 Canadian National Reserve Champion Western Pleasure AATR 19-39, and Blue J, 2015 U.S. National Champion H/A Western Pleasure Futurity. Of the 40 national top ten awards won in 2015 by *Khadraj NA get, 33 were in western competition. Awards won were in open, amateur and youth competition. At the close of 2015, *Khadraj NA+++/ is the sire of a lifetime total of 99 national winners, with 424 national awards, 61 national championships and 44 reserve national championships. Among them are 51 national and/or reserve national champion *Khadraj NA sired sons and daughters. An amazing 64% of these won their awards in Western Pleasure, 11% have followed suit in Halter and there are several extreme athletes included in this group as well. These include RA Lanai, winner of 19 national awards, including national championships and reserves in Reining, Working and Reined Cow Horse, and Equitation, with open, amateur and junior riders, and ST Shamrock++++//, winner of 19 national awards, including national championships and reserves in Dressage, Working Hunter and Hunter Hack. *Khadraj NA+++/ is the sire of 468 registered offspring, 261 females and 207 males. Among them are 404 purebred Arabians and 64 Half-Arabians. His sons are especially sought after as exceptional show horses and sires, and his daughters are the stuff of legends as producing broodmares. The first *Khadraj NA foals arrived in the mid-1990’s, and nearly all of those existing daughters are still producing. A good example is one of the stars of *Khadraj NA’s first major foal crop, NNL Emerald Bey (x NNL Beygabi, by *Bronnz). A multi-top ten in western pleasure at both the Canadian and the U.S. Nationals, she was also the 2001 Canadian Reserve National Champion Halter Mare AAOTH. NNL Emerald Bey is the dam of four national winners: two Quarter Horse-sired Half-Arabians, both top ten Half-Arabian western pleasure amateur, and two purebred daughters, MH Jade (by Brioni Carol), U.S. National Top Ten Halter Mare AAOTH and Elle Pershahn F+ (by Pershahn El Jamaal), Canadian National Top Ten Western Pleasure Jr. Horse and Select AATR. Another *Khadraj NA daughter, Lovins Khrush SSA (x Lovin Spoonful VF, by Fame VF+), is the dam of nine foals, three of them national winners, including her son Krusayder+// (by Eternety+), a 10-time national top ten in western pleasure competition. He’s won at Youth, Canada and the U.S. National Championship shows.